The government is to investigate the use of electric shock training devices on dogs, but has rejected a bill calling for them to be banned outright. Animal welfare minister Ben Bradshaw said that while he sympathised with the concerns about cruelty, there was insufficient evidence for a ban. Electric shock devices, often collars, deliver a shock to the dog's neck to control behaviour in training. 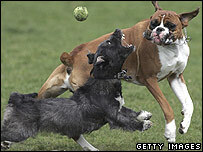 Critics say they can be misused and cause aggression in well-behaved dogs. The private member's bill had called for a ban on selling, importing, or using the devices. Mr Bradshaw told MPs his department was "committed to spending a considerable amount of money" on research. He said Britain's chief vet had written to all other countries in the European Union to find out how they dealt with the devices. Two states have banned them but the majority have introduced legislation to regulate their sale and use. "We are keen to understand more about this and learn from other countries what their best practices are," Mr Bradshaw told MPs. He added: "We do need to have a strong evidence-based research before we consider [a ban]." The department has commissioned research which is expected to begin later this year. He pointed out that any misuse would already be covered by cruelty offences in the Animal Welfare Act. He said he had heard from dog lovers that "they have found that these devices very, very useful as a last resort to prevent their dog behaving in a way which could have led to their dog suffering far more." He used the example of a farmer shooting a dog, or a dog being injured by a car if it ran on to the road. MP Sarah McCarthy-Fry, who introduced the bill, said it was clear there was support for the ban. "Whilst the minister didn't believe legislation was appropriate at this stage, I do hope Defra will see fit to consult on this issue in the same way the Welsh and Scottish devolved institutions will be doing." Conservative MP Andrew Robathan said the devices themselves were not cruel - "if animals do suffer cruelty, it's the fault of the owner, not the device itself". He questioned whether the "minor" shocks did actually cause harm, and called for more research.